Sterling, IL, 2019: Sterling Systems & Controls, Inc. announces availability of its automation application module for the Pelleting of feed material and other agricultural and industrial applications. While the pelleting process has historically been done manually, the Sterling Systems & Controls pelleting system uses your production requirements and formulas to create a customized and fully-automated pelleting process. Upon starting the main pellet mill motor, the Pellet Mill control application will start running the feeder at a predetermined speed when the idle condition on the pellet mill motor is reached. The startup feeder speed is determined by the hot or cold parameters. After the pellet mill electrical current threshold value is reached (shown on main pellet mill screen), the steam valve is opened to a preset setting based on hot or cold die parameters. 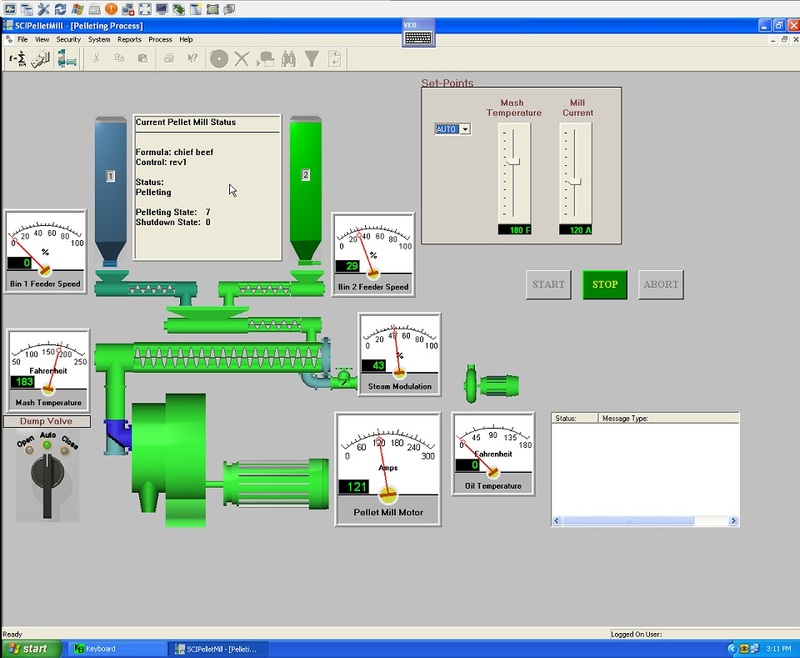 The Pellet Mill control application is constantly evaluating the information. Feeder adjustments are made to bring the pellet mill electrical current to target levels. Feeder speed ramps up, steam valve is also ramped up. The feeder and steam adjustments continue until the current and mash temperature set-points are reached. This provides for smoother and faster achievement of maximum efficiency with minimum downtime. Benefits of the Sterling Systems Pelleting application includes: SUPERIOR APPLICATION PERFORMANCE: Custom design ensures the Pellet Mill automation application is just what you need and want, ensuring optimum operation, maximizing throughput and mill output. DEPENDABLE MILL OPERATION IS ENSURED: Pellet Mill application monitors key mill operation and functions and ensures dependability and maximizes up time. More information on the Pelleting Application for Feedmill automation use (applicable to other industries as well) is available from Sterling Systems & Controls. With many decades of experience providing efficient solutions for plant-wide and process control and automation, process equipment, batching, micro, minor and bulk weighing, bag unloading systems, bag loading, bag dumping, Sterling Systems & Controls, Inc.’ designs utilize the latest technology to provide specialized data management, raw material management, along with production data tracking. For more information contact Sterling Systems & Controls at 1-815-625-0852 sci@sterlingcontrols.com, and at www.sterlingcontrols.com.